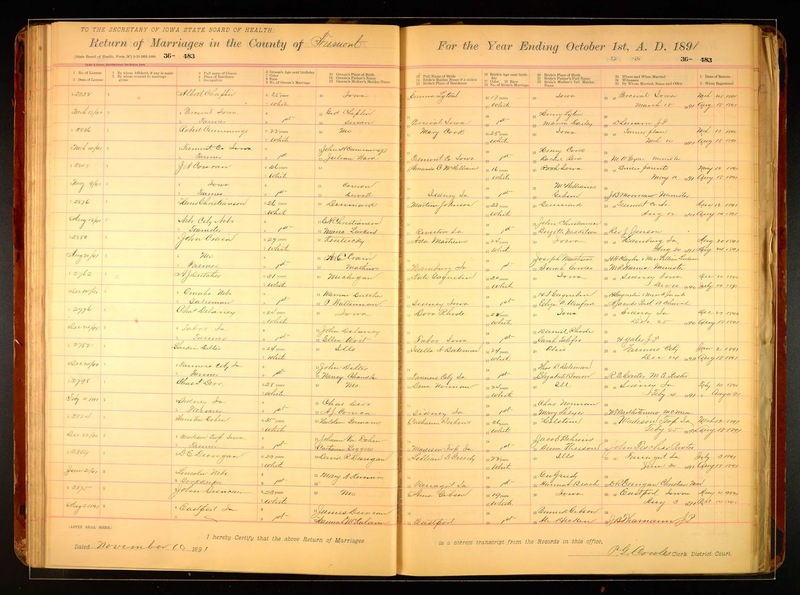 Recently, I discovered that Ancestry had added the Iowa, Marriage Records, 1880 - 1937 database to its collections. While I don't have Iowa ancestors, my children do on their paternal grandmother's side. I was hoping to confirm marriage information for their great-great-grandparents, Albert Francis CHAPLIN, Sr. and Emma Alice LYTON. A family history written by an aunt of their grandmother lists Iowa as their marriage place , but no date is given. Their eldest child was born in 1892 in Surprise, Butler Co., Nebraska, but the next two children were both born in Fremont Co., Iowa , as was Emma , so I figured that was the likely location of their marriage. The record is written across the top two lines of the register. I've enlarged and cropped the image to facilitate reading it on this blog. You can click on any of the images in this blog to view an enlargement; then use your "Back" button to return to this post. As you can see, both Albert and Emma were living in Percival, Fremont Co., Iowa and that is where they were married on 18 March 1891 (confirming the Bible entry) by the Justice of the Peace, D. Lumm. 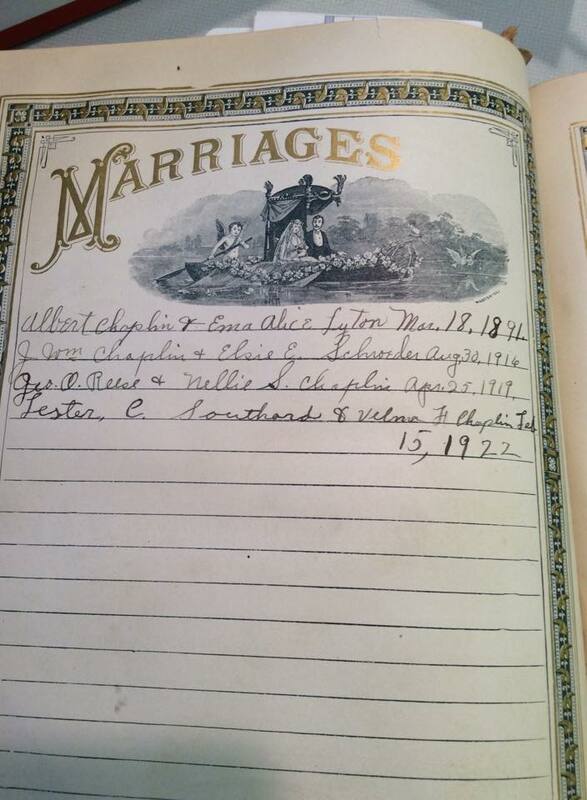 It is interesting to me that no witness names were recorded on this register page for any of the marriages recorded here. That's too bad; I would have liked to have known who the witnesses for their marriage were. From other research I've done, I know that their parents' names were not quite recorded in full or with accuracy here. Albert's parents were Gideon CHAPLIN and Susan W. HAINLINE. Emma's parents were Henry LYTON and Maria(h) Emily DAILEY. Henry's name was an alias. He was born George TURK in Ottawa, Ontario and came to the U.S. to serve in the Union Army during the Civil War. He changed his name at that time, although it is not clear exactly why. 1. Southard, Velma Chaplin, The History of the Chaplin Family as of December 1970, p. 4. 4. Albert and Emma (Lyton) Chaplin Family Bible, 1867-1922; The Holy Bible Containing the Old and New Testaments (undated, no publication information); privately owned by Mary Duncan [ADDRESS FOR PRIVATE USE], Washington State, 2015. Dates from 1867 to 1919 appear to have been written in the same hand and at the same time. One marriage entry, dated 15 February 1922, appears to be written in the same hand, but at a later time than the other entries. 5. 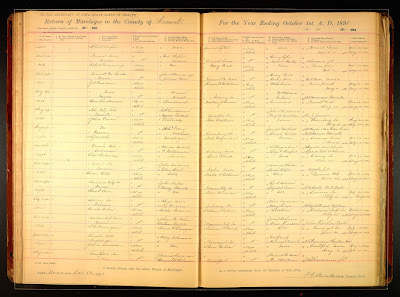 Fremont County, Iowa, Return of Marriages, 1880-1922, vol. 36, p. 483, Albert Chaplin-Emma Lyton, 18 March 1891; digital images, Ancestry.com, “Iowa, Marriage Records, 1880-1937” (http://search.ancestry.com/search/db.aspx?dbid=8823 : accessed 24 November 2016). "Mug books" are collections of biographical sketches usually found within county histories of the late nineteenth- and early twentieth-centuries, particularly in the United States. On Mondays, I'm highlighting ancestors or relatives who were featured in these mug books. This biographical sketch is actually about the son-in-law of a couple of my ancestors, my adoptive 4th-great-grandparents, Dennis CONCIDINE, Jr. and his wife, Honora "Nora" GILLIGAN. I include it here, because in several sentences mentioning his wife's family, it mentions this couple, as well as a third ancestor, Dennis' father, Dennis CONCIDINE, Sr. It's another good example of expanding your search beyond your direct ancestors, and looking at siblings, cousins, and in-laws. The Concidine name has a variant spelling of Constantine in this biography; understandable considering Concidine and Considine (another variant) both mean Constantine. 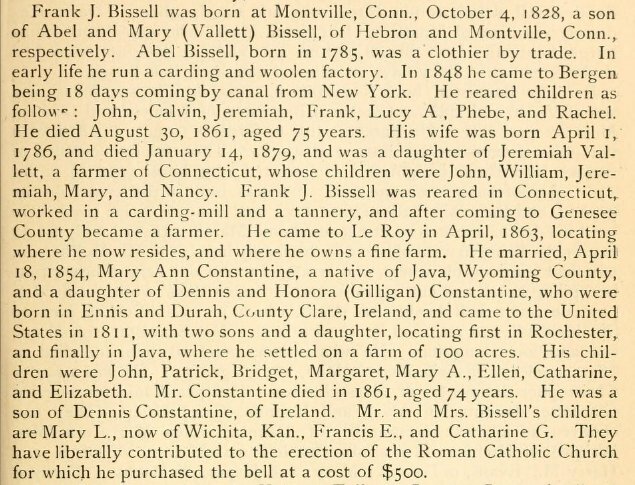 "Frank J. Bissell was born at Montvale, Conn., October 4, 1828, a son of Abel and Mary (Vallett) Bissell, of Hebron and Montville, Conn., respectively. 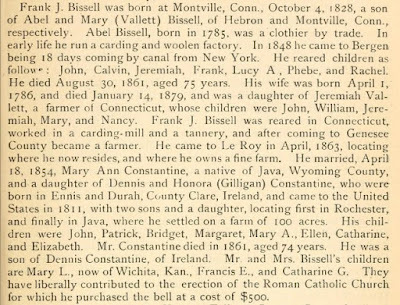 Abel Bissell, born in 1785, was a clothier by trade. In early life he run [sic] a carding and woolen factory. In 1848 he came to Bergen being 18 days coming by canal from New York. He reared children as follows: John, Calvin, Jeremiah, Frank, Lucy A, Phebe, and Rachel. He died August 30, 1861, aged 75 years. His wife was born April 1, 1786, and died January 14, 1879, and was a daughter of Jeremiah Vallett, a farmer of Connecticut, whose children were John, William, Jeremiah, Mary, and Nancy. Frank J. Bissell was reared in Connecticut, worked in a carding-mill and a tannery, and after coming to Genesee County became a farmer. He came to Le Roy in April, 1863, locating where he now resides, and where he owns a fine farm. He married, April 18, 1854, Mary Ann Constantine, a native of Java, Wyoming County, and a daughter of Dennis and Honora (Gilligan) Constantine, who were born in Ennis and Durah, County Clare, Ireland, and came to the United States in 1811, with two sons and a daughter, locating first in Rochester, and finally in Java, where he settled on a farm of 100 acres. His children were John, Patrick, Bridget, Margaret, Mary A., Ellen, Catharine, and Elizabeth. Mr. Constantice died in 1861, aged 74 years. He was a son of Dennis Constantine, of Ireland. Mr. and Mrs. Bissell's children are Mary L., now of Wichita, Kan., Francis E., and Catherine G. They have liberally contributed to the erection of the Roman Catholic Church for which he purchased the bell at a cost of $500." I did not have a death date for Frank or a birth or death date for Mary Ann. I did find their graves (here and here) on FindAGrave.com, which gave me that information. A biography of Frank's brother-in-law and Mary Ann's brother, John D. Concidine, was featured on an earlier Mug Book Monday post here. This biographical sketch was taken from Gazetteer and biographical record of Genesee County, N.Y., 1788-1890, edited by F. W. Beers and published in Syracuse, New York by J. W. Vose & Co., June 1890. Frank's sketch was found on page 515. This county history, along with many other ones, can be found at the Internet Archive.